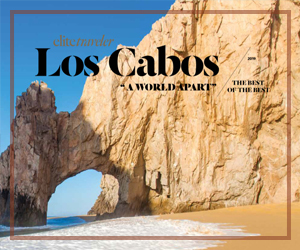 Starting on Tuesday morning the Los Cabos International Convention Center hosted the VIP Summit in its 12th edition. This is the marketing affair considered by most in the destination as of premier importance. "We’re bringing in the main commercial partners, for who we have two specific strategies being implanted at this 12th VIP Summit. First, consolidation in the primary markets: USA, Canada and Mexico, which is why the main trading partners from the three countries here, this is where one-on-one negotiations are carried out with hotels and tourism providers for our destination, "said Rodrigo Esponda, Director, FITURCA Los Cabos. Present during this edition are 65 companies from 11 countries, 1,100 meetings are scheduled during the three day event. Together with us, negotiations are carried out for new connectivity, promotion actions, cooperatives agreements, and all will be carried outside as well, for conducting activities in most of the markets. The second strategy is diversification, for which we’ve brought in buyers from 8 different countries other than Mexico, USA and Canada; from places like Australia, Great Briton, Italy, Korea, Brazil, Argentina and Colombia, they are also going to carry out negotiations, one on one, it’s an opportunity for them to know and develop their products even better ". It’s also a time to show off hotel offerings that this destination has. It should be noted that 2018 will be closing with a hotel inventory of 17 thousand 500 rooms, which has grown by 6% this year. "It’s the most important event we have in the hotel industry, it’s where the hotel sector takes the opportunity to sit down with all tour operators, wholesalers and airlines that bring the client to the destination. It’s where you have the opportunity to review rates, to see the programs if they have worked or if not. Fortunately the comments we have had with the tour operators, is that Los Cabos is the number one destination in growth, for them, in the country, it is the destination that’s setting an example, "said Paloma Palacios from the Hotel Association. During this year’s event, we also presented the strategies that help the promotion of Los Cabos, and that talk about the natural beauty and attractions offered by this destination to tourists for their travel experiences.